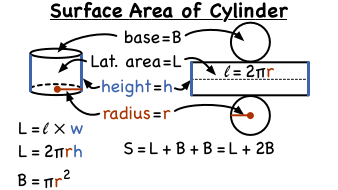 To find the lateral and surface areas of a cylinder, itâ€™s important to know their formulas. In this tutorial, youâ€™ll learn about each of these formulas and see them used in an example. Check it out! Want to know how the find the lateral and surface areas of a cylinder? Then this tutorial was made for you! You'll see how to apply each formula to the given information to find the lateral area and surface area. Check it out!